I don't use my Sigma 28mm f/1.8 II quite often as I would love to as I have a tendency to stay with zooms in outings in the weekends and vacation. I busted my prime with 28mm this weekend with Mid-Autumn festival with lanterns and moon cake and a visit to Don Edwards SF Bay Wildlife Refuge for its Shark Day event. Lens is easy to handle like a 50mm in size. Close up is found decent on flowers but I don't think it has magnification ratio greater than 1:4, likely 1:6. Flare is noted in extreme lighting when my neighbor lighting shined through the front of my lens. It was possible that I forgot to mount the lens hood. An overall budget fast prime that do reasonably well at night but nothing in sharpness and color that would stand out like the 31mm limited. 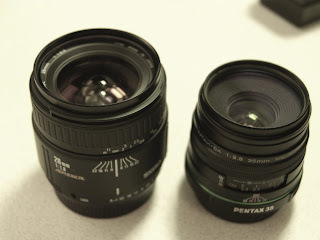 Color rendering is better in Pentax 35mm limited and the 31mm limited lenses. Nice shots, Hin. I especially like this one. As you know, I own the Sigma 24mm f/1.8 EX DG. It's a lot bigger than your older version, using 77mm filters (the 28mm EX DG uses the same body as the 24mm). In comparison, the Pentax 31 Ltd is tiny. Oh, and my 24mm also reports f/1.7 to the camera when wide open; this must be a glitch in the Sigma aperture encoding. I also suffered from ELUF (Expensive Lens Using Fear), but I am trying to get over it. To do that I am using the 31 Ltd as my normal prime and it stays on my K10D most of the time. The other day I saw its first scuff mark :-( But, I spent good money buying that lens, and the only way to make that expenditure worth it is to use the damn thing. The most expensive lens is the one that stays at home and is never used! I also discovered a scuff on my Cosina 55mm f/1.2. What I've figured out is that these marks are caused by the lenses rubbing against each other in the camera bag, not by the lens actually being used (unless you drop it). I am now buying little pouches for my metal primes so as not to scratch them in the camera bag. Thank you to both of you. You two use your lens as tool and a great partner in taking good pictures. If I ever get my 2nd 31mm, I would put it to the most use to get its money worth with memorable pictures. so, all in all, do you like the 28mm? im considering getting one. Yes, I like the lens especially that I get a good used copy with a reasonable price under $150.0. This prime is all plastic and it does not have the good build quality that you find in other lenses in Sigma Ex series. I will suggest NOT to hold your expectation high on the build quality. Though I find it dependable with fast speed, lightweight, reasonably good sharpness. I find color good but it can be better.